Artist Mike Leavitt has just released an action figure of Matthew Barney (sort of an amalgam of several of Barney's characters from the Drawing Restraint and Cremaster series, it includes two Jacobin Pigeons from Cremaster 5 as accessories) as the latest addition to his Art Army series. The figure is available from Jonathan Levine Gallery in New York City, where it will be exhibited in an upcoming show. We're not sure of the price for the Barney figurine, but others in the series sell from $900 - $1200. 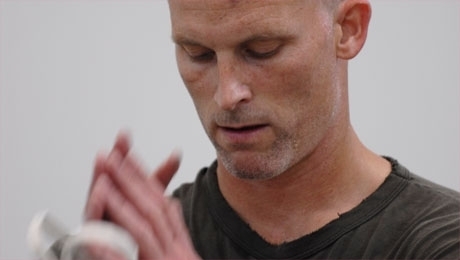 Matthew Barney will receive the Persistance of Vision Award at the 54th San Francisco International Film Festival. The Persistance of Vision Award is given yearly to a filmmaker who works outside of traditional narrative filmmaking. Previous recipients include Errol Morris, Guy Maddin, and Kenneth Anger.